In my store I sell lots of Indian head cents. And I sell a variety of other things such as: Wheat pennies, Copper pennies, and Copper rounds. And a 1853 Dime in around very fine condition, and very nice Steel pennies. Usually if a Indian cent has a liberty it is in fine or more condition. The liberty is on a head band on the head. If I say bu that means brilliant uncirculated. A coin that has a D on it means it was minted in Denver, a S means San Francisco, and a P or no mint mark means Philadelphia. The letter is under the date. A nickel is boring, right? Wrong! Come and find out what is so interesting about these ubiquitous coins. 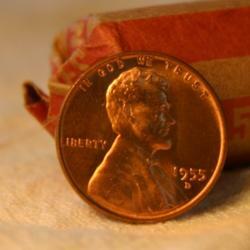 Wheat pennies are very interesting. Come and learn all about the designer, and the steel penny, the infamous 1955 double die error, key dates, and some other errors. Dimes have a long and interesting history. Here is a summary of the changes the dime has seen since its creation.